McGuinness claims Cowen called him and others out for speaking in a personal capacity during interviews. (R) Fianna Fáil spokesperson on Public Expenditure Barry Cowen and (L) FF TD for Carlow–Kilkenny, John McGuinness. 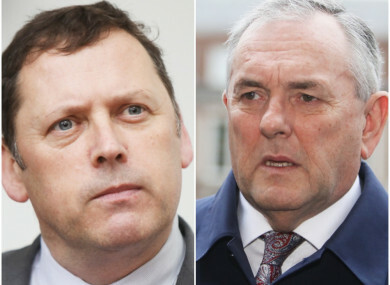 FIANNA FÁIL TD, John McGuinness has said he was indirectly asked to consider going independent following a clash at a private parliamentary meeting last night. The Carlow-Kilkenny TD told RTÉ’s Today with Sean O’Rourke that at last night’s meeting the party’s spokesperson on Public Expenditure, Barry Cowen, called out McGuinness and others for speaking in a personal capacity on topics such as the confidence and supply agreement with Fine Gael, which was extended until 2020. In what he described as a “robust” exchange, McGuinness said he told Cowen and the rest of the party that he would not be bullied or intimidated “into a position where I did not agree with it and I was free to voice my own personal voice on this issue as many others have”. “I wasn’t asked directly but you could say that in a combination of words it could have been interpreted that a request was being made of it,” he said. He added that he wouldn’t consider leaving the party because he “went into that party to make an impact on it, and I will do everything in my power to do it”. I think it’s a nonsensical immature suggestion to make because political parties are about democracy, they’re about debate. Fianna Fáil’s announced last month that it will continue to prop up Fine Gael through the confidence and supply agreement until 2020. Leader Micheál Martin said at the time that despite his misgivings with Fine Gael’s record, his party would be extending the agreement as a result of the uncertainty posed by Brexit. McGuinness claims that there are some people in Fianna Fáil who are still not happy with the party because they are not representing the views of its members around the country. “Not to say these things is to ignore a large part of the public and a membership of the party,” he said. I think it’s a good healthy sign that we can have these types of debates and move on from them. But there is that concern within the party and it’s ongoing. He went onto say that he believes the Government is being kept in place by the actions of Fianna Fáil and that the party should receive “some sort of price in the interest of the Irish people from them”, such as greater transparency or support for bills that have been backed by the Dáíl. Email “Fianna Fáil's McGuinness claims he was 'indirectly' asked to 'go independent' after clash with Cowen ”. Feedback on “Fianna Fáil's McGuinness claims he was 'indirectly' asked to 'go independent' after clash with Cowen ”.